The Ironhand Gauntlets are the gauntlets used by the bandit Hajvarr Iron-Hand, the leader of the bandits who operate out of White River Watch. 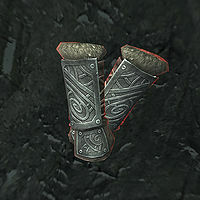 The gauntlets themselves are actually steel Nordic gauntlets, despite their name. They have been enchanted to fortify two-handed attacks by fifteen points. Tempering the Ironhand Gauntlets requires an iron ingot and the Arcane Blacksmith perk, with the benefits of the alterations doubling if the Steel Smithing perk has also been unlocked. This page was last modified on 29 November 2018, at 16:30.